Nikolay Suvorov interacts with a student at the counter of Sunnyside Café. 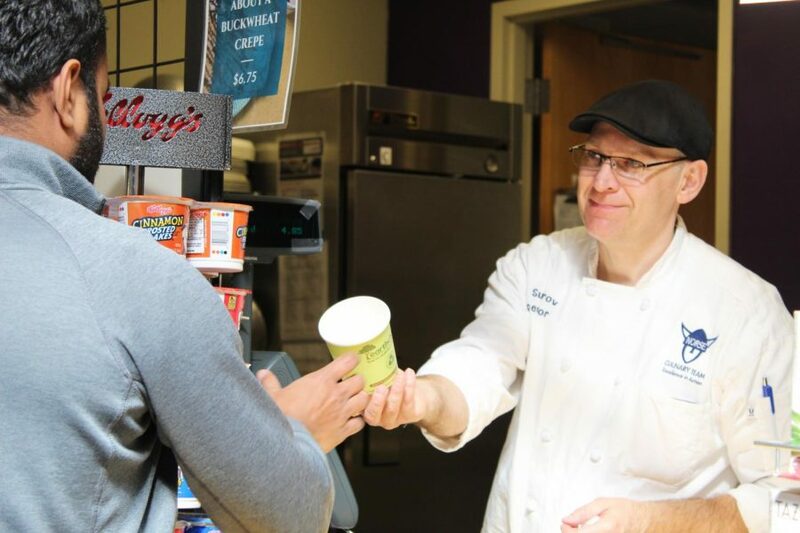 Since arriving at Luther seven years ago, Nikolay Suvorov has impacted the food and beverage options served at places such as Sunnyside Café and Nordic Brew by adding new items to the menus. Suvorov’s most popular addition to Sunnyside’s menu is his crêpes and to Nordic Brew, the Moscow Fog. Suvorov’s cooking career began in Russia while studying geology at college. Before coming to Luther, Suvorov worked at a factory in the United States for ten years and was then hired by Sodexo to work at Luther. Although Suvorov does not have professional culinary training, he gained experience working at Marty’s for four years and working part-time at Family Table for two years. Suvorov began to work at Sunnyside almost three years ago when he proposed the idea of making crêpes. Nikolay Suvorov makes a savory crêpe for a student. Dining Services Operations Manager Diane Narum (‘01) thought this move was a good fit for Suvorov. 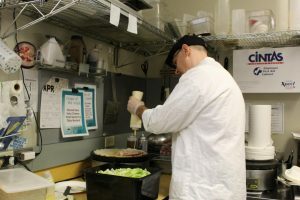 At Sunnyside, Suvorov makes crêpes and other food items like drinks and cinnamon rolls for students, faculty, and Decorah community members. Suvorov also gets to be creative with food and drink recipes, proposing various dishes like banana-strawberry crêpes and the crêpe dog, which is a crêpe wrapped around a banana with Nutella. Suvorov created the Moscow Fog, which is an alternate version of a London Fog that replaces the traditional vanilla in London Fogs with honey. He encourages student workers to come up with new crêpe flavors and creative names for drinks. Suvorov oversees everything at Sunnyside from checking safety and inventory to managing the student workers. It was also his initiative to have student managers at Sunnyside beginning last year. Student manager Megan Johnson (‘19) appreciates his positive energy. Suvorov works to create a positive environment at Sunnyside for both student employees and customers. Giang Nguyen (‘21) is a regular customer of Sunnyside and enjoys and interacting with Suvorov.